These are the options a user can select when responding to a questions. Typically you could use the values already entered. Each column also has a number value, this could be -2,-1,0,1,2 or any combination that will be practical for you. The value must be a number. Responses are displayed depending on the sum of all the responses. IF the total is between x and y (inclusive) then the response will be displayed when the user selects ‘Check results’. You can reorder the questions using drag and drop. The ‘reverse’ values option will reverse the column values for the selected question. Select the generate button above to test your questionnaire. 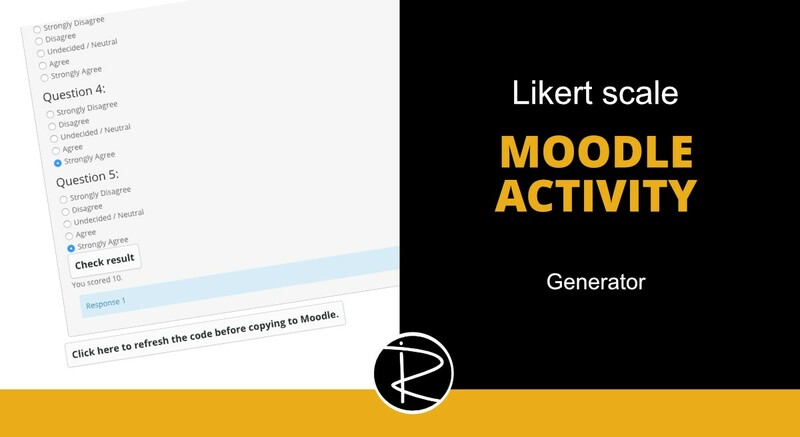 Click here to refresh the code before copying to Moodle. The code below can be copied into the HTML section of a Moodle page.